Growing up in Michigan I was not as well versed in the knowledge of fish as I am today. I knew about Pike, Whitefish, Walleye and Rockfish as most of my fishing career was spent on a lake in Upstate NY. It was not until I moved to South Florida as an adult that I even heard of this Hogfish and not until I actually started selling fish for a living did I know how popular this fish is. The Hogfish is little known to those outside of the Sarasota to Florida Keys area. I love the unflattering name and the look of this fish as its name comes from its hog-like snout and man do I love the taste. It is hard to even keep this fish in stock as once it hits the retail fish counter or restaurant menu, this delicate and mild fish flies out the door. I would describe this fish as the perfect combination of flavor and texture because it is sweeter than Grouper, flaky like a Cod and as rich as Scallops. When I say this iconic fish is mild tasting I mean it! When asked to describe the flavor by my customers I either tell them it’s like biting into a delicious cloud from heaven or it’s the Filet Mignon of the sea. This is a great fish to eat whole (baked or fried) and it is also delicious when served as a filet with a sauce such as a lemon butter caper sauce like a Francaise or Piccata style. Unfortunately, like I mentioned earlier, this fish is hard to come by and most places can’t put this fish on the menu because they cannot guarantee a consistent inventory. Chef Aaron of Big Water Fish Market does have it on the menu and serves it with his own honey Sriracha cream sauce with a steamed seasonal veggie medley. Hog fish is a bit more expensive than the other fish due to the issue of supply and demand. Another reason this fish is a bit rare is because the Hogfish will not bite a hook and line. Smart fish. This fish actually has to be spearfished. The best Florida fishmongers have a spear fisherman with a steady shot on the payroll. A missed shot with a speargun can result in damaged flesh. As I write this article I’m in Marathon, Florida and already have Hogfish on the brain. I plan to head south to the Hogfish Grill in Key West today to satisfy my craving. 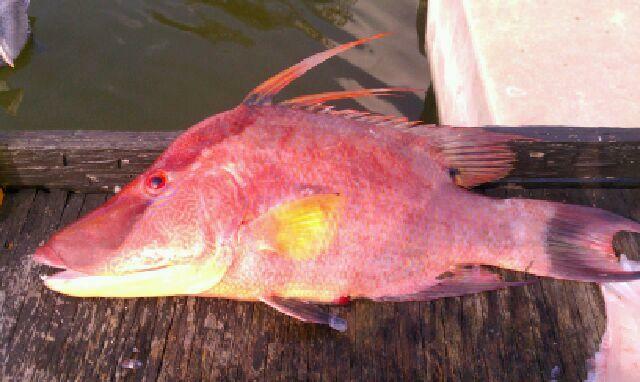 Hogfish is not from the Snapper family as most people think. It is actually part of the Wrasse family and is more closely related to a Parrot Fish than a Snapper. Hogfish uses its elongated pig-like snout to rummage and graze for crustaceans that are buried in the ocean floor. Juvenile Hogfish start out as female and then become male as they mature. Males tend to be more intensely colored with a signature black spot behind the pectoral fins. Females are pale grey or brown in color. Hogfish have been recorded to live up to 11 years. Heat 2 tablespoons of olive oil in a large sauté pan over medium-high heat. Season your 4-ounce Hogfish fillets (total of 2 pounds of fish) with Deli Dust and dredge in flour. Sauté the fish in oil for about 4 minutes, flipping halfway through. Remove the fish to a platter. Deglaze the pan with ¼ cup white wine, whisking for about 1 minute. Add 2 juiced lemons and 2 tablespoons of capers and stir. Add 2 tablespoons of butter and whisk away to incorporate and bring the sauce together. Pour your sauce over the fish and garnish with fresh chopped parsley and a lemon wedge. Bon appetit!